Top seeds Ian Harris and Daniel Lowinger both won their first two games against Nicolas Checa and Ethan Segall. In their final round faceoff, both players battled hard until the final few seconds of the game, and in the end Lowinger emerged victorious. The second quad saw a three way tie after top seeded Melvin Patrick lost to Grant Wang. 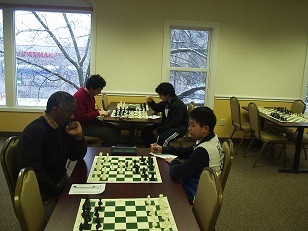 Wang fell to Noah Arthurs and Arthurs lost to Patrick. Congratulations to everyone on a well fought tournament!